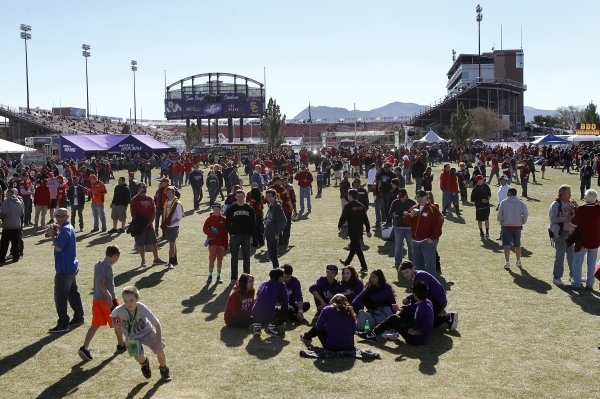 The Royal Purple Las Vegas Bowl continues to draw large crowds and even larger TV audiences by making the host city the star of the show. Despite being stuck in a glut of midtier, early season college bowl games in December, the Royal Purple Las Vegas Bowl continues to draw large crowds and even larger TV audiences by making the host city the star of the show. And that commitment to the allure of Las Vegas has helped the bowl grow as local businesses and sponsors have benefited from the success of the game, which is entering its 24th season. 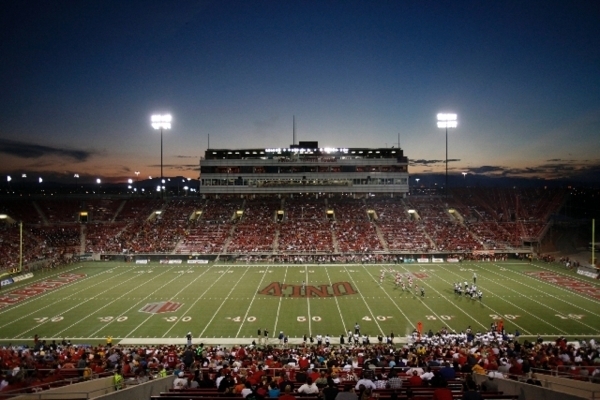 The plan this year is to bring the Strip out to Sam Boyd Stadium. Saccenti said there will be stages set up in the stadium featuring headlining acts from the Strip performing during quarter breaks. This year’s game is at 12:30 p.m. Dec. 19. The game will be televised nationally on ABC. There will be a DJ contest, featuring the best campus DJs from the Mountain West and Pac-12, the two conferences that participate in the bowl game. There will be two DJ booths with each conference’s representative set up inside the stadium to create “this fun crazy atmosphere,” Saccenti said. And before sponsors or ticket buyers balked at having a DJ playing house music at a college football game, Saccenti said fans ultimately get into the music. Creating a fun vibe and positive atmosphere with a Las Vegas-flair has helped keep the bowl game running over the past 24 years. During that time, the game has brought in more than $250 million to the local economy and more than 380,000 visitors, according to numbers provided by the Las Vegas Convention and Visitors Authority. The largest crowd to date has been the 44,615 fans who bought tickets to the 2006 game featuring BYU vs. Oregon. In 2013, the game between Fresno State and USC brought in 42,178 fans. 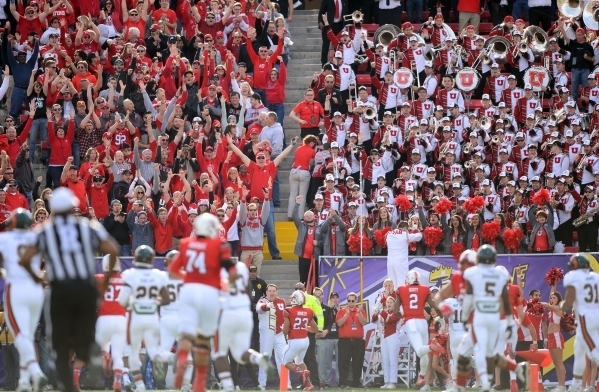 Saccenti added that last year’s game featuring Colorado State and Utah brought in about $25 million. And those kind of numbers, during a traditionally slow time in Las Vegas, has made local businesses eager to support the game. Of course, it doesn’t hurt that college football is tied with Major League Baseball as the No. 2 fan sport. “First of all, sponsors and advertisers like being involved in the bowl season, the tradition that goes into it and festivities surrounding it because it is unlike the regular season,” Saccenti said. “We focus on local sponsors who love college football and want to be a part of college football. It’s the No. 2 sport behind the NFL, and they want to get involved with an unbelievably powerful brand. Two of the biggest local sponsors are the two host hotels — the Hard Rock Hotel and Mandalay Bay. Saccenti said the Hard Rock Hotel, which has 3,600 rooms, has been sold out for the past three years during bowl week. Last year, the bowl game was responsible for 24,000 room nights. And of course, all those hotel guests mean hotel and casino employees are working during a slow time, which means those workers are earning extra money to spend with local businesses during the holiday season. 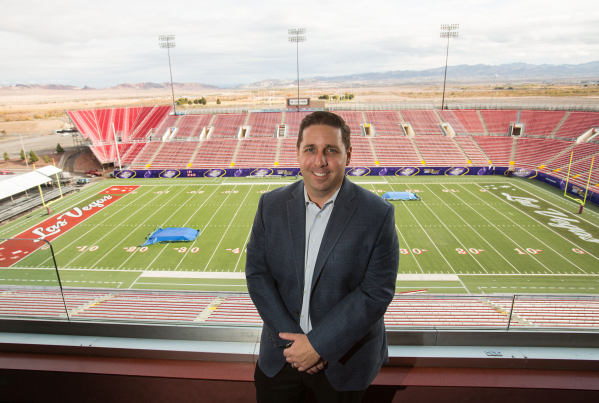 “The Hard Rock Hotel & Casino is part of the Las Vegas Bowl because it’s the largest event taking place in December, and it gets us national, primetime press,” said Mark Rowland, executive director of group sales at the Hard Rock. “It’s a very prestigious event for us. Although sponsorships and advertising are important, Saccenti said the real success of the game comes from ticket sales, which can be quite tricky because bowl matchups are announced two weeks before the game. And although the sales team starts selling the game in March and April, many people want to know who is playing in the game before buying tickets. And of course a full stadium also helps sell sponsorships. “Everything revolves around tickets. Tickets are the No. 1 priority,” he said. “My background is in sponsorship sales. I’ve never been a ticket sales guy, although I end up having to do that. If you are selling tickets, filling the stadium and creating a buzz, more people want to buy tickets because the perception of the game has changed a bit. It is a sold-out, must-see event.